Army moonwalk rentals, Army bouncy house & Army birthday party ideas in Phoenix, AZ. The Army Combo Bounce House has beautiful art work perfect for Army birthday parties. 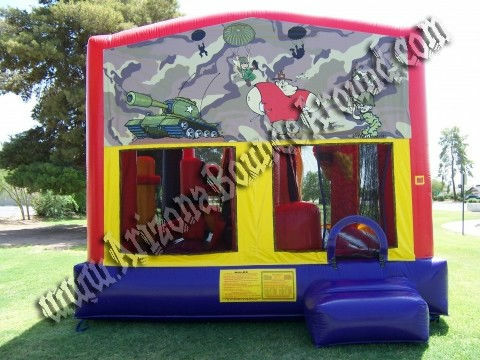 Rent this 5&1 Inflatable Army Bounce House with 14' slide, Basketball Hoop and Inflatable Obstacle Course inside for your next sports themed party. The Army themed moonwalk features a smaller size bounce area, Big Inflatable Obstacle Course and basketball hoop inside. The 14' Slide is really steep and fast, perfect for any age group giving your party guests more to do. The slide features an easy to climb stair case and No jump netting. It also has a front step making entering and exiting very easy. Adults and kids of all ages can jump in the bouncy area and go flying down the steep drop slide inside. The 5&1 Army Bounce House has beautiful art work perfect for boys and girls.